Once graduation has come and gone many new job seekers pursue their dream of winning the perfect position at a great company. Some work internships during summers off from school, hoping to secure a full-time position upon graduation. 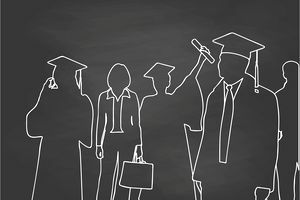 Others start searching for employment in the months before they graduate, and send out resumes to follow up on job postings from the school's career center. At some point, if you do these activities, participated in on-campus recruiting events and did your share of networking, you might have a list of potential job prospects. Those who graduated in 2017 and 2018 have a much better time finding jobs than those who graduated in 2008, for example. The fact is, jobs and the employment rate fluctuate over time, and thousands of new graduates just like you flood the job market every year. In previous years, with many applicants applying for the same job, employers had to filter through hundreds of resumes to select candidates that they felt made the best fit for their organization. However, the unemployment rate has continued to improve each year since 2000, and in 2018 it sits at less than 5 percent. The past few years' worth of students have graduated into an economy that has plenty of jobs to offer. It may sound like you'll have no problem finding a job, but if you want to land a specific job in a certain company or industry, it pays to increase your chances of conducting a successful search by taking extra steps to make yourself stand out among the other applicants. The Job Outlook 2017 Survey says that employers plan on adding 36 percent more jobs in the coming year. While this generally bodes well for job seekers, the following tips will show you not just how to land any job, but how to present yourself in a professional manner and ace every interview so that you have your pick of jobs that you actually want. Do what it takes to create a resume that lands in the top five to 10 percent of candidates. Make sure that your resume and cover letter don't have any typographical errors, grammar mistakes or other issues. One mistake can get your resume and cover letter immediately filtered into the wastebasket pile, with no further consideration. Find ways to differentiate yourself from other candidates in order to prove to the employer that you are the perfect person for the job. Target your resume to the specific position as much as you can, so that it reflects that you have the experience and qualities to do a good job. For new graduates who don't understand why they're not getting called for interviews, take another look at your resume and cover letter. Be sure to engage in networking with family, friends, and acquaintances to uncover unadvertised job listings and get people that know you to make personal recommendations to employers who are currently looking for entry-level candidates. You’ve probably heard the old adage, “it’s not what you know, it’s who you know”, and nothing could be closer to the truth than when looking for a new job. Finding a job in a specific field or industry can often be cyclical, so research which companies are currently hiring in your field. Many trends often exist in certain career fields based on saturation in the current job market. For example, over the years, both shortages and an abundance of both teachers and nurses have occurred. Once a field becomes saturated, it's very hard to get a job until the trend reverses and employers can't find enough people for jobs in that particular field. If you want to enter a job market that is currently hiring very few new people into the field, you may have to accept this fact for now and do something else until the trend reverses. Many new graduates have taken jobs that were not in their field, only to have the market change to where they were able to land the original job they wanted in a few years if they still decided they wanted it. Although the current environment boasts a low unemployment rate and eager employers in many fields ready to hire, some new graduates who don't land their dream job right away lose motivation after only a few months and totally let go of their job search. This common mistake can cost you that new job if you don’t maintain your diligence by searching regularly for and following up on new listings that may pop up at any time. Create a resume and cover letter that competes with the top five to 10 percent of candidates. Network with everyone you know so you can find out about unadvertised opportunities and so that others know you are looking and can recommend you for current job openings. Keep abreast of the current job market so you can be one of the first people to apply once the job market opens. Maintain a proactive approach to your job search so that you don’t miss out on any new positions that open up. How to Ace the Interview Question: What Are Your Greatest Strengths?